> Legacy Village Holiday Rewards – December 15 – 16! Home • Events•Legacy Village Holiday Rewards – December 15 – 16! Legacy Village Holiday Rewards – December 15 – 16! 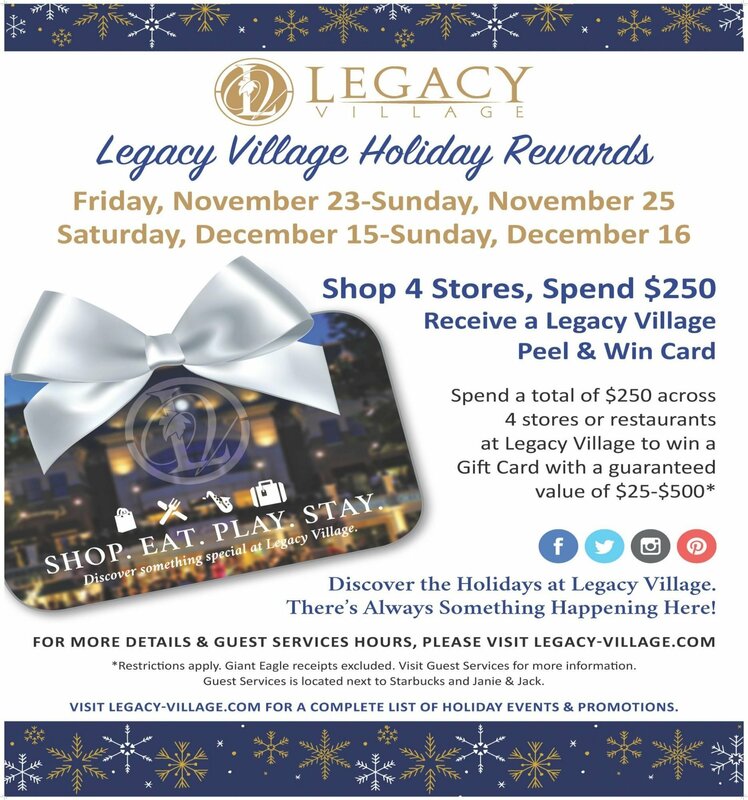 Shop 4 Stores, Spend $250 and receive a Legacy Village Peel & Win card! Spend a total of $250 across 4 stores or restaurants to win a Gift Card with a guaranteed value of $25 -$500*! *Every card is a winner! Qualifying receipts must total at least $250 and be from four or more different stores or restaurants at Legacy Village, dated between Saturday, December 15- Sunday, December 16, 2018. Please note that receipts from Giant Eagle are excluded. To redeem qualifying receipts, visit Guest Services, located on Main Street next to Starbucks and Janie & Jack. Guest Services is open on Saturday 12/15 from 11 a.m. – 5 p.m. and on Sunday, 12/16 from noon- 5 p.m. Must be 18 years or older to participate. One Bonus Card per customer, while supplies last.